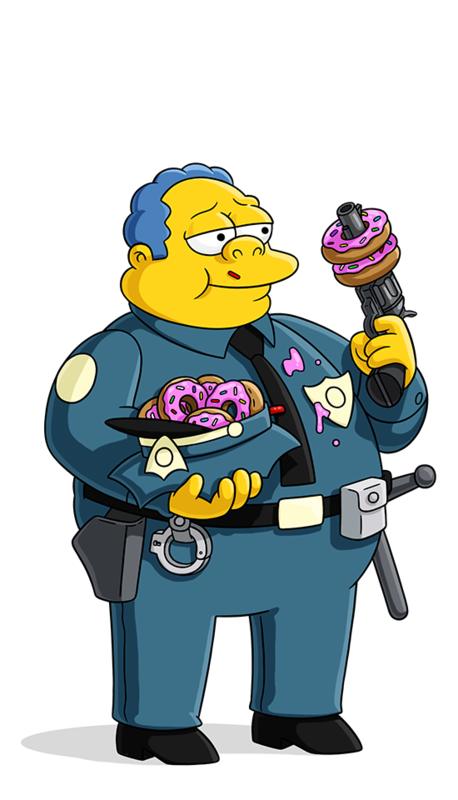 Clancy Wiggum is Springfield's Chief of Police. He personally insists on handling all calls involving donut shops, ice cream parlors, and food-processing plants. Homer tells the story of when he used to be in a barbershop quartet. Freddy Quimby mocks a waiter and Bart witnesses a fight. Homer gets caught for stealing Moe's car. Duncan is forced to dunk into a swimming pool in front of a crowd. Homer and Marge talk to the police after Mrs. Bellamy's death. Chief Wiggum arrests Homer for transporting litter. That's the end of your Looney Tune, Drugs Bunny. You're under arrest for astro-vandalism. Can't a man spend one minute with his stuffed monkey? One minute?